Scientists announce interesting new data about the beginning of life on earth and the evolution of the solar system which postulates some interesting ideas about the levels of cosmic rays and sudden star formation and crashes. The idea that the early sun fluctuated greatly in energy output is now accepted but the idea that the sun is part of a star group that was sucked into the Milky Way still is inconceivable due to mental inertia. 2.4 billion years ago, the Milky Way was busy absorbing a group of smaller galaxies. The new insights, announced this week by the Danish National Space Centre, propose that the evolution of life on Earth is closely linked to cosmic rays - "atomic bullets" that shower down on our planet from exploded stars. The scientists' research says that cosmic ray showers were most intense during a "baby boom" of stars, where many such rays burst into Earth's atmosphere. The scientists say these fluctuations in biological production happened when the Earth was also going through a cooler period, where cosmic rays likely had an influence on cloud formation. I have suggested before, the solar system didn't arise within the Milky Way but was part of a smaller, poorly organized galaxy or rather a mass of mass (heh) that fell into the Milky Way's gravity pool around 5 billion years ago. Due to this interaction, the smaller mass burst into star-making activity, most of which was the classic hot-white stars that exploded rapidly. The new elements created by these explosions became the materials used by the lower-wattage stars that developed as the Milky Way absorbed this smaller unit. This is why our very old star, a third of the age of the universe, is still way out on the far reaches of an arm of the Milky Way. So, if this is what happened, let's look at the fluctuation of life on earth from a different perspective: the sun, a star a lot less dynamic than the very hot white giants, was a small, pokey thing in comparison, the runt of the litter type of star. There are many of these stars in galaxies. Unlike the giants, these stars are much more stable so we assume they were always stable. While the star is organizing itself, consolidating its interior, I would suggest it fluctuated in output by a considerable degree. This causes the planets circling it to recieve wildly varying amounts of energy. The planet earth, when it was younger, was also warmer, namely, it had more heat from the mantle and the core. So when the sun's output dropped suddenly, the surface might have iced over nearly totally but the waters below were considerably warmer than today and the number of volcanic vents were many times greater. Many times. Here is another attempt at telling this story, putting all the influence of the fluctuation of life on earth up the idea that it varied due entirely to cosmic ray levels. The stellar baby boom period of the Milky Way sparked a flowering and crashing of life here on Earth, a new study suggests. Some 2.4 billion years ago when the Milky Way started upping its star production, cosmic rays--high-speed atomic particles--started pouring onto our planet, causing instability within the living. Populations of bacteria and algae repeatedly soared and crashed in the oceans. Let's go back to the early earth: scientists admit life flowered during the ice cycles. Unlike surface life forms, creatures evolving in the deep part of the seas next to the many volcanic vents which were pumping away everywhere thanks to the oxygen and hydrogen molecules combining to form water, life arose as soon as this water cooled down. Just like today, in Yellowstone Park, hot vents in the middle of winter, support life forms, so it was on the early earth. Cosmic rays tear into anything on the surface but as one plunges deeper into the oceans, the protections rise. The cosmic ray bursts from the companion stars that formed rapidly as the captive smaller galaxy was sucked into the Milky Way, disrupted the chains of molecules that kept madly combining and re-combining and this fueled evolution but the growth/crash cycle wasn't caused by the cosmic rays at all. Why would starmaking be CYCLIC? It is ongoing even today. We see today, groups of white-hot fast evolving stars not in the inner ring of the galaxy but on its outer edges and these are nearly always in-falling smaller galaxies! And when two huge galaxies fall into each other, this sort of star formation explodes exponentially and these galaxies are extremely bright. Galaxies that are not sweeping in new material are usually not so brilliant. So why did the earliest populations boom and crash? Because this is a law of nature: all systems boom and crash. Nature tends to consolidate until it can't consolidate anymore and then it blows up or crashes. There is no 'steady state' if one looks at any system on a long enough time cycle. 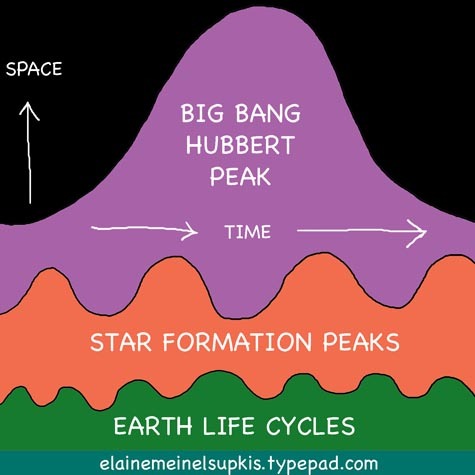 The Big Bang is the most obvious example of this boom/bust cycle. If all things boom and then bust including the entire universe, this means anyone imagining the universe is going to peter away into nothingness are wrong since laws of nature tend to be pretty iron-clad. Exploding outwards/falling inwards is the natural pulse of all matter and all things visible and invisible. Life on earth in the earliest years fluctuated wildly because there were few life-forms and therefore, no countervailing systems to keep things from going in a tight cycle of booms and busts. The amazing thing about life forms is how it can take energy from the hot planet's subsurface and combine it with the molecules in the H2O and then cannibalize each other for ever-greater complexity of molecular chains! The accident that caused these molecular chains to be able to replicate themselves meant they would start vast chain reactions which would end up using up all the available material in a mono-molecular habitat, namely, everyone floating around the ocean were very nearly the same. We know there is an upper limit to all living things dictated by the habitat and availability of raw materials and every time these replicators succeeded in using up all available raw materials, the chemistry of the oceans would change so radically due to this, the replications would then collapse into their component parts and become part of the 'soup' again. This might have been nudged along by the increasingly active star formation activity going on in the group of stars falling into the Milky Way. All around the Milky Way, 4 billion years ago, smaller star systems were falling into the gravitational pool and this triggered intense starmaking and lots of big explosions. But the boom/crash cycle on earth merrily chugged along and I would suggest the ongoing cosmic ray activity was NOT CYCLIC at all but simply part of the active background noise. The boom/crash cycle is inherent in life cycles of all things. When new life forms invade a settled ecosystem, the iron rule is, the invaders will flourish and the natives will die and the invaders will cause a sudden rise in their numbers while the natives literally go extinct, even. Once the invaders fill all the niches of the natives, they crash and then become incorporated within a new ecosystem balance which will be stable until either outside forces or new invaders create new chaos. The more there is chaos, the more there is boom/bust cycles. When volcanic actions, sun energy output fluctuations, tectonic plate movements and star building/bursting activity destabilizes an ecosystem, there is a higher rate of extinction and elimination followed by a new organization of the biomatter and within the pulse of boom/bust cycling are great booms and great busts and even when 90% of the life forms collapsed due to the atmosphere and the oceans radically changing their chemistry and temperature, the recombining of the molecular chains reasserts itself and life springs ever-renewed. It seems to me that great extinctions happen when there it too much junk in our neighborhood and the planet's system gets disrupted too much for most life forms to survive. Planetary scientists have found evidence of a meteor impact much larger and earlier than the one that killed the dinosaurs -- an impact that they believe caused the biggest mass extinction in Earth's history. The 300-mile-wide crater lies hidden more than a mile beneath the East Antarctic Ice Sheet. And the gravity measurements that reveal its existence suggest that it could date back about 250 million years -- the time of the Permian-Triassic extinction, when almost all animal life on Earth died out. Its size and location -- in the Wilkes Land region of East Antarctica, south of Australia -- also suggest that it could have begun the breakup of the Gondwana supercontinent by creating the tectonic rift that pushed Australia northward. The more we can 'see' the more complex the past becomes. The planet earth got hammered by stray objects and other things back when the mini-galaxy we were part of became increasingly compressed as it approached the Milky Way. This meant that anything nearby became nearerby, so to speak. Today, we have settled into a new track and are moving along at a pace that isn't the same as other stars around us but rather, our orphan sun sort of moseys on along the same track everyone else is moving as they rotate around the monster black hole at the center. We still don't know how these giant black holes first began.